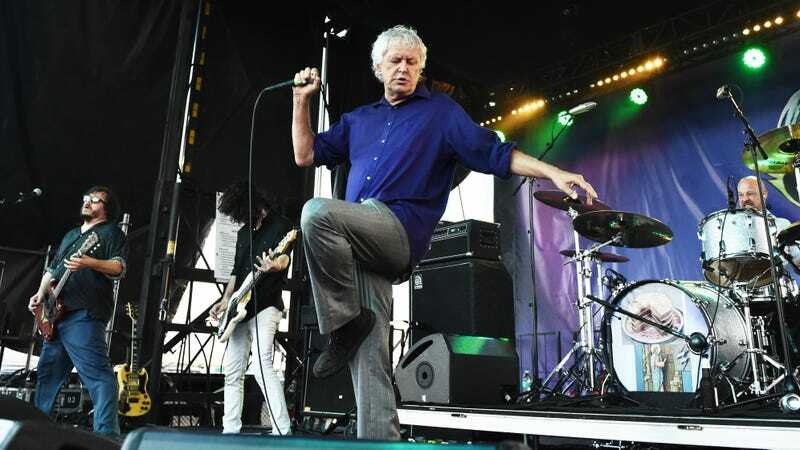 We've got an exclusive stream of Guided By Voices' latest earworm, "My Angel"
It’s been a while—eight whole months!—since the last Guided By Voices LP, and as longtime fans have come to expect, the group has been busy. Along with the upcoming albums, Zeppelin Over China and Street Party, we told you about back in July that are coming in February 2019 and February 2020, respectively (Zeppelin Over China is a double album, by the way), Robert Pollard and the crew have written and recorded a third upcoming album, Warp And Woof, coming next April, banging out songs in hotel rooms, during sound checks, and even in the van during their 2018 tour. The band’s label describes Warp And Woof as a blast of scrappy breakneck rock ‘n’ roll, saying in a press release that it “exuberantly barrel[s] through 24 songs in just 37 minutes with a brevity similar to mid-90s GBV albums Alien Lanes and Vampire On Titus.” It’s also teasing Warp And Woof with two pairs of limited-edition, vinyl-only 7" EPs: Wine Cork Stonehenge and 100 Dougs on December 7, and Umlaut Over The Özone and 1901 Acid Rock in March. We’ve got an exclusive stream of “My Angel,” the opening track from Wine Cork Stonehenge, along with the EP’s hilarious cover art, track listing, and GBV’s upcoming tour dates, below. Featuring a steady guitar groove, high-kickin’ tambourine, and a earworm of a chorus, the song is less than two minutes long, but it’ll be in your head all day. 6) The Pipers, The Vipers, The Snakes! 11/09 - Los Angeles, CA -Teragram - SOLD OUT! 11/10 - San Francisco, CA -GAMH - SOLD OUT! Guided By Voices looks to the future in an exclusive debut of its new 7"